The A.V. Club: This seems to be your legal drama episode. What made you apprehensive or what did you enjoy about verging into that genre? I was afraid of it. At the same time, I was like, okay, it feels like a necessary component of this story that we have to address the reality of what would be happening, and they would be going into a pre-trial situation at this point. Part of me thinks that we could’ve not done the trial episode and just kept him in a pre-trial place for a long time, because that could take months or years. For me, I felt like we were definitely venturing out of my personal comfort zone as a storyteller, but I felt like it was a necessary step. Actually, there’s a lot of things in that episode that set up big things in episode five, so it felt like in order to really appreciate episode three, you have to see it in the context of episode five, which I think is one of our best episodes. AVC: One thing that TV writers run into, especially on serialized shows, is that the episodes that are setting things up for later payoffs can seem lesser compared to the others. How do you combat that feeling? BF: It’s tricky. We have a couple of those, where it’s like, this is an episode that sets some things up, and it’s tricky going through the episodes. Episode three is an uncharacteristic episode for us, because it is setting up a lot of things, and it is in a format that is not traditionally what we’ve done on this series. It was a bold move that I hope we achieved some success with, but I was definitely very nervous about it. I think in setting up things, the validation of the episode comes from the payoff—and I just hope that the setup is still satisfying for the audience as they get to go on a journey and wonder who this copycat or the author of the love letter that is sent to Will Graham is, that they are intrigued by that story enough to be excited about the episode and then excited to see how it’s paid off. AVC: You raise some false hopes for Will that the crimes of Hannibal will be pinned on the copycat. Was that something you ever seriously considered doing, or was it just that you wanted to see how he would interact with these false hopes? BF: No, it was very much about the false hopes, and it was also a way for Hannibal Lecter to be able to tell Will that he is worthy of love and admiration, and he is saying, “Here is this person out there that loves you enough to do this act.” We should absolutely think that it’s Hannibal at that stage of the plot, and Will should think it was Hannibal at that stage of the plot, and it was a way to express Hannibal’s affection for Will, regardless of everything that’s happened between them, regardless of Hannibal manipulating Will into incarceration. There is still affection for him, and it is a very tough, ugly love that Hannibal feels for Will. That felt like it was a great opportunity to express that, and then subvert it, and then two episodes later turn it inside out and throw it back. AVC: You bring the courtroom killer into everything here. It almost plays like a drawing room mystery. Is this something the audience can follow the clues along with it and solve it later in the season? BF: Absolutely. They’ll solve it in episode five. Episode five is so fun, and so many things happen, and it really is part of a very satisfying arc of stories that are very intricately woven. Three really is something that I think you’ll benefit from seeing before episode five, and then episode five goes above and beyond what you would expect from who you think that killer’s going to be. AVC: The notion of killers sending each other messages through corpses seems very Thomas Harris. What’s appealing about that as a writer? BF: It’s a different way of communicating, but the important thing was that it is Thomas Harris. We did read that happening and see that happening in the adaptations, between Francis Dolarhyde and Hannibal Lecter. It’s also to set up the sweetness of the “You have an admirer!” At one point you’re like, “Oh, who’s my secret admirer? It’s so fun! Who could it be?” but this time the admirer is someone that is dangerous and deadly, and how far will they go? So we will absolutely learn who that secret admirer is, and I think it’s very satisfying in the reveal. What Will does with that revelation is also something that is very Thomas Harris, but you’ll have to see episode five. AVC: You’ve played around a little bit with Hannibal’s emotions. How much do you think he really misses Will? BF: I think he absolutely misses Will. I think he absolutely loves him. I don’t think it is a sexual love, as much as it is this meeting of minds and a very lonely man who sees another very lonely man, who can understand him and appreciate him, and he sees the opportunity for true, genuine friendship for the very first time in his life. So I think it absolutely is genuine, Hannibal’s affection for Will Graham. But… he’s… nuts [Laughs.] so you don’t want that affection. So that’s kind of the fun of it. And I think it has to be true, and I think it has to be a genuine love for him to continue to persecute Will in the way that he does. But all out of the motivation of, “This is tough love. This is going to make you a better person. This is going to make you a truer person to yourself. 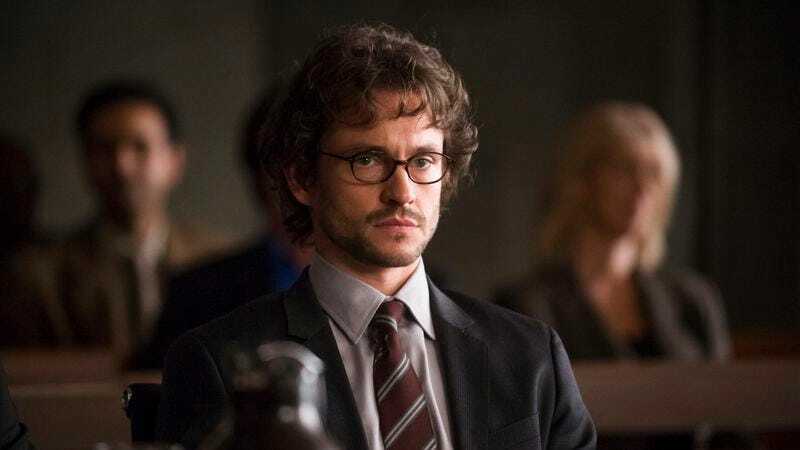 And I have to take these steps, and I want to be with you on that journey and watch you.” There’s another Thomas Harris quote that we use later on in the season, where Hannibal says to Will, “I can feed the caterpillar. I can whisper to the chrysalis. But what emerges is truly its own thing,” and that’s what’s happening with Hannibal and Will. AVC: Do you think this is unique to Hannibal’s life? Has he had these feelings of intense friendship or intense love before, or is this something that has really gone beyond anything he’s familiar with? AVC: Flipping that question around, do you think Will could ever be convinced Hannibal is not guilty, as he wavers a bit here? BF: I think once we passed that point… no, I think he’s rather convinced. AVC: Raúl Esparza is such a fun presence on this show, and you’ve worked with him a number of times. What has he brought to the character of Dr. Chilton, and why do you like working with him? BF: I love Raúl. The first time I was exposed to Raúl, seeing him and hearing him sing “Being Alive” from Company, it just went right to my soul where he captured all of the angst from Bobby from Company and really transported me to that emotional state of the character. I just thought, “Oh my God, this guy is a genius. I have to work with him in some capacity.” We cast him on Pushing Daisies, and he was wonderful there, so when we were talking about Frederick Chilton, he was the first person who popped into my mind, because I think he can do smarm with likability. And Anthony Heald is so iconic as Chilton in some of the films that we wanted to have that same kind of likability but obnoxiousness, that careful alchemy of those elements. Raúl just felt like he understood the material, he understood the character, he knew that he was comic relief, and he knew that he had to capture the tone of the rest of the world with his sense of comic relief. He’s struck such an interesting balance because [Laughs.] he vibrates on such a different frequency from all of the other cast members and has a goofiness to him and a broadness to the character, but it all feels like it is existing within the parameters of the world. I think that’s a really tough act—to be able to come into a show like Hannibal, function as comic relief, and also maintain a consistency of tone with the rest of the world. It takes a very specific actor to be able to navigate that. I just knew Raúl could do it, and I love being in the editing room with those scenes with Raúl, because he always tries something new and something funny. He improvises, like in the first one when he’s like, “Hannibal, Hannibal, Hannibal…” None of that was really scripted, and it just felt like he was such a goof that it’s fun to roll your eyes at him, but you’re actually invested in his role. He has such a big role in events to come that it gets even bigger in five, six, and seven, of how tied into the mythology of what’s happening between Hannibal and Will. If you’re loving Raúl so far, you’re going to love what he does in five, six, and seven. Come back next Saturday for discussion of episode four. You won’t want to miss that one.